It is common for drivers to have mixed emotions when it comes to buying a new car. Oftentimes, there is a combination of being overwhelmed, nervous, anxious and excited. Car salesmen can be tricky, because that is their job! Instead of letting you walk out of the car dealership with a frown and a furrowed brow, the team at Drivers-Licenses.org is here to improve your experience. Consider the below tactics and tips so that you can feel confident in your new car negotiations. Whether your current car is on its last miles, or the end of your lease is soon approaching, you know you are in the market for a new car. However, be strategic in planning your visits. Begin by choosing one model of a car that you like. Then, add similar models from other makes to your list. When it comes to visiting one or several dealerships, Drivers-Licenses.org says there is no need to do it all in one day. Plan your visits over the course of at least a week, which will give you breathing room to compare all of your offers. If you do decide to visit multiple dealerships in one day, make sure you have ample time blocked out for each place. That way, you won’t feel pressured or trigger-happy because you are in a rush. Buying a car at the end of the month is always a great idea for those who want to negotiate successfully. You will have a strong chance of working your price down, because salesmen often try to end the month on a high note with a last sale. If your contract is make or break for a salesman’s numbers that month, he or she is likelier to work with you in order to close the sale. In addition, if you visit just slightly before closing time, you may wind up with a better deal, because the team is eager to both get one more sale locked in for the day, and to close up shop. You know your personal finances better than anyone else – except maybe your accountant. Because you are the one who is signing this new car contract, you must take the time to create a budget for your new purchase. Decide what price range is doable for a down payment. If you cannot afford a hefty down payment, will you be able to pay larger monthly installments, instead? Also, if you are transitioning from a sedan to an SUV, do the research to find out how much your gas expenses will increase with each tank. And, finally, will your car insurance be impacted by your new car choice? With safety features and an optimum design, your monthly insurance premium may actually go down. All of these factors are crucial in determining your budget. 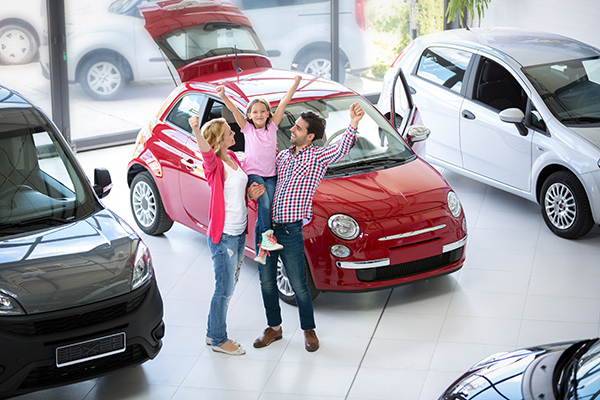 If you are prepared and have a set budget – even with a little bit of wiggle room – you are less likely to be taken advantage of when you visit a dealership. Whether it’s a new safety shield, the upgraded luxury package or a tire and maintenance deal upfront, your new car payment may jump up $75 per month if you say “yes” to the extra features offered. Keep in mind that you really do not need to buy something you cannot walk out with that day. Car dealerships will try to squeeze every last penny out of you until you walk out feeling deflated and helpless – even when you do sign your contract. Avoid regret by standing firm in knowing what it is you want and what it is you need. Unless your car is broken down in the parking lot of the dealership, or your lease is due back by sunrise, there is no reason to be impulsive when buying your car. Taking your sweet time will provide you peace of mind along the way and may make the patience of a salesman grow thin – but to your advantage. If you are in the market for a same-day purchase, take a few hours in the dealership to mull it over if you need. Remember: No one is forcing the pen into your hand to sign the contract. When the commercials on TV start streaming one after the other declaring year-end auto clearances, you know it’s definitely time to buy your new car. The team at Drivers-Licenses.org believes the best time to negotiate is when a dealership needs to clear out the inventory of the previous year to make way for the new models. Car salesmen are generally eager to work with you in order to take these cars off their lots, as this means clearing the floor faster and making a commission. A few months prior to planning your visit, do your research to find out when new releases are slated to ship, and then, make your calculated move.